Christopher Carelli: How big is tonight’s start for Yankees’ Tanaka? How big is tonight’s start for Yankees’ Tanaka? Suggesting that Game 158 for the New York Yankees is big when the postseason is within grasp, is certainly not an overstep in narrative. 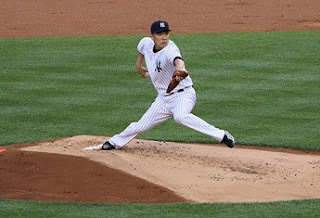 But, Masahiro Tanaka’s performance lamented as the be-all and end-all game of the season is pushing the dialogue a bit. Surely, Tanaka’s Wednesday night start against the Boston Red Sox is important for several reasons. First, the Yankees desperately need a win to get the taste of the playoffs on their lips instead of sniffing it in front of their noses. Secondly, the Yankees must have Tanaka tuned up for his potential start in the American League Wild Card game. Third, and in my mind most importantly, Tanaka has to prove he is healthy enough to pitch without abandon. He cannot come into today’s game giving less than 100 percent. If Tanaka cannot go full throttle, he’ll be of no use to the Yankees for the wild card affair. Notice I did not say that Tanaka has be lights out Wednesday. I believe it would be inappropriate to expect him to dominant the Red Sox, or any other team for that matter, with 11 days passed since his last start. Would it help the Yankees if Tanaka looked as good as or even better than he had before suffering the mild hamstring strain? Yes, of course. But, expect it? I don’t believe that’s fair under the circumstances. In my estimation Tanaka will prove ready for the wild card tilt if he can toss close to 100 pitches, throw his four-seam fastball in the 93-95 mph range, have a good feel for his splitter (even if only on occasion) an command the strike zone (at least for extended periods). I fully expect Tanaka to have a bit of a time getting into a rhythm this evening, and I will not feel the season is over if he just doesn’t have it. But, it will be entirely disconcerting to me if he shows any ill-effects from the injury, or worse looks as though he is babying himself on the mound. Much as I wrote earlier for SNY about the Yankees offense, Tanaka, the remaining starters and the bullpen have to put the pedal to the metal. There is plenty of time to get past the aches and pains of the season over the winter. If Tanaka is not 100 percent healthy, he cannot be counted on in the postseason. Right now, the biggest piece to Tanaka’s start is demonstrating he’ll be able to handle the immense pressure of a one-game playoff from a health standpoint. We’ve seen Tanaka come up big in important games, so that is not a question in my mind. If he can walk off the mound in complete health Wednesday night, the results, while important, are secondary to the bigger picture for the Yankees.